How is it possible that someone could face years in prison for sharing an academic paper online? How did we arrive at such extreme criminal punishments for accessing knowledge and information? Well, this has been long in the making. We got here because Big Content interests have dominated secretive, back-room copyright negotiations over several decades, resulting in laws that are increasingly restricting our speech, and our ability to comment, control, re-use, and access knowledge, culture, and the devices that we own. This is especially relevant for Open Access Week, which is all about making publicly-funded information and knowledge available free of licensing restrictions. Although some forward-thinking governments and publishers are helping to realize this dream, in a majority of cases the full force of copyright law still applies to constrain access to knowledge, with dire consequences for those like Diego Gomez. The Colombian law that is being used to prosecute Diego for sharing an article online was passed following the conclusion of the US trade agreement with Colombia completed in 2006. The law was designed to fulfill the trade agreement's restrictive copyright standards, and it expanded criminal penalties for copyright infringement—increasing possible prison sentences and monetary fines. Although we have not seen a case like Diego's before, such extreme criminal provisions are not unique to Colombia, nor are the provisions in the trade agreement they signed with the US. There are close to a dozen bilateral US trade deals that contain copyright provisions that echo US law. For the most part though, they are actually worse because they do not contain many of the public interest protections that are built into US law, such as fair use. But these bilateral agreements are just one part of a longer story. They followed a series of international agreements from the World Trade Organization and the UN World Intellectual Property Organization that initially bound its signatory nations to more stringent digital copyright enforcement provisions, and which in turn led to the US passing the Digital Millennium Copyright Act. Now, we are in a post-bilateral copyright agreement phase, where nations are entering (or at least trying to enter) into massive plurilateral agreements that also contain stronger copyright enforcement measures, such as the Anti-Counterfeiting Trade Agreement (ACTA) and the Trans-Pacific Partnership (TPP) agreement. This method of venue shifting is called policy laundering. That's when policymakers, at the behest of content industry interests, cycle unpopular policies through international negotiations that would otherwise fail if directly introduced back at home. These international law making bodies do not have the same standard of democratic oversight or transparency as many domestic-level rulemaking systems, and there is no single governing body that regulates these policies. So these venues have become a moving target, circumventing accountability while raising the global standards of copyright enforcement before our eyes. Last week, there was another leak of the TPP's Intellectual Property chapter and it confirmed once again that the US Trade Representative (USTR) is pushing extreme copyright proposals in the trade agreement. In it, there are all kinds of limitations on users that could lead to greater restrictions on people's ability to access and share research and information. For instance, the USTR is proposing increased criminalization of copyright on multiple fronts, such as including acts that are not commercially motivated and situations where people may not even know, but may have "reasonable grounds to know", that what they are doing is illegal. Such broad, ambiguous definitions of what is a criminal copyright violation will continue to have a huge chilling effect for users who only seek to access works that may already be openly licensed or are in the public domain. Ideally, countries forced to adopt these draconian policies would also enact a flexible system of exceptions and limitations to balance copyright's restrictions. But the language on exceptions and limitations in these trade deals are never robust enough to properly balance the interests of rightsholders with the public interest. They prescribe something called the "three-step" test, which is essentially a standard that countries must reach when passing a new exception and limitation to their copyright law. Colombia has a fair dealing system, a closed list of exceptions to copyright that must be passed legislatively, rather than the open-ended, flexible exceptions permitted by a fair use system (like in the US). Colombia's list of exceptions was issued more than 20 years ago, and are so narrowly tailored to some specific situations that they are not at all applicable to the digital age. Thus none of them are sufficient to apply to Diego's case, even if it was done for educational purposes. The three-step test has previously been used to strike down new exceptions to copyright law at the national level. In the infamous Fairness in Music case, an international tribunal ruled US law in breach of the three-step test, by allowing music to be played in restaurants and retail stores without payment of royalties. The fact that these agreements do not have a robust requirement that signatory nations enact strong rights for users, but rather, includes terms that only seem to limit the kinds of rights that nations can adopt, speaks volumes. While customs and practices around academic publishing will undoubtedly shift towards becoming more and more open, there's still a long way to go to fix state policies to enable and promote access to research and information. It does not help that many countries, like Colombia, are bound to international deals that oblige them to enact restrictive copyright laws that may undermine domestic efforts to improve access to knowledge. 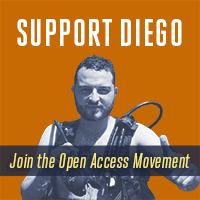 Unfortunately, that means that Diego is unlikely to be the last academic who faces imprisonment for simply sharing an article. Between October 20 and 26, EFF is celebrating Open Access Week alongside dozens of organizations from around the world. This is a week to acknowledge the wide-ranging benefits of enabling open access to information and research—as well as exploring the dangerous costs of keeping knowledge locked behind publisher paywalls. We'll be posting on our blog every day about various aspects of the open access movement. Go here to find out how you can take part and to read the other Deeplinks published this week.